Happy New Year, readers. I know it's been awhile since I've posted on here, but small things HAVE been taking place. Unfortunately, none of them involve any actual sewing. Today I'm letting the cat out of the bag and announcing that my winter's project will be making an authentic Scottish kilt. So where to begin? Several months ago I ordered Folkwear's #152, Scottish kilts. The pattern includes a history of kilts, and the tissue to make a man's Prince Charlie jacket, or coatee for those perfectionists among us. There are also instructions for knitting argyle socks (No Way!) and a sheet outlining the process for making a kilt. There is no physical pattern for a kilt. It's essentially a rectangle of fabric pleated to fit the wearer's measurements. Emboldened and armed with this pattern I went in search of my tartan. My search ultimately brought me here.... to the incredible Scotland by the Yard in beautiful Quechee, Vermont! This store is a shopper's paradise for all things Scottish and Irish. Need a wool scarf in your tartan? I'll take one of each! Or maybe you need a new sporran to hold your wallet and cell phone? Check out the skunk fur one at the top center. LOVE!!! Once I stopped drooling over everything in the store I got down to ordering my tartan fabric. Georgia, the owner, pulled out a massive swatchbook of tartans and quickly thumbed to my family's dress tartan. This woman really knows her tartans and is a wonderful resource. She showed me the different weights available and I settled on an 11 oz fabric. It's the same weight as the ready made kilts sold in her shop, and it seemed acceptable to me. The typical kilt takes 8 yards. Because the fabric is 60" wide only 4 yards is required. The length of tartan is cut down the middle to make 2 long strips. 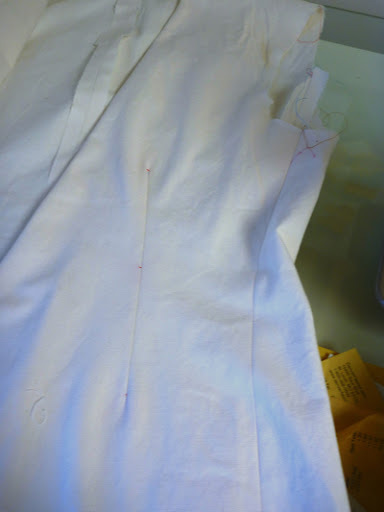 The two selvedges become the bottom hem of the kilt. I ordered 5 yards because I'd also like to have a matching fly, which is a large tartan sash worn over the shoulder, trailing down the back of the jacket. Hey, I'm only going this way once. Right? 4 weeks later I received a phone call that my fabric had arrived, and back to Vermont I went. Here is Georgia, of Scotland by the Yard, presenting me with my dress tartan. 100% wool, the real deal from Strathmore Woollen Co., Forfar, Scotland. All you tartan aficionados will be able to figure out my last name now! Have fun with that. The color here is really off because of a fluorescent light, but here I am with my 88 year old mom. She lives in a retirement community in NH and doesn't get out much. This was such a great field trip for her, she was like a kid in candy store.